Chelsea maintain their lead at the top of the Premier League. The Tigers didn’t go down without a fight, however. Positional changes in the first half, from Hull, caused Chelsea problems after taking an early 2-0 lead. Second half changes by Mourinho allowed Chelsea to regain control of the game to take 3 points away from the KC stadium. Hull began the game playing against the ball, looking to press the Chelsea build up around the halfway line, then using the depth runs of Hernandez to attack the space behind the Chelsea centre backs and Ivanovic, in transition. In possession of the the ball they would play direct and long from the goalkeeper, N’doye being the target to play flick ons, and the emphasis being still on attacking the same spaces as in transitions. They would have good, deep, support from the wing backs in longer phases in possession of the ball, as well as the central midfielders joining attacks in central and wide areas. The team was set up in a 532 against the ball, 352 in possession of the ball: Alex Bruce as the middle centre back; Dawson and McShane as the wide centre backs; Elmohamady and Robertson as wing backs; Meyler, Livermore and Ramirez as the middle 3; Hernandez and N’Doye as the strikers. Here is where the initial positioning of their players caused them problems in their pressing. As they would keep the back 5 deep zonal players, with man orientated aspects, Chelsea were able to overload them in the Chelsea half when the Blues were in possession of the ball. This would lead to the midfield line moving up to press, but without proper access to the ball. As a result, the midfield and defensive line would split and become disconnected and opening space for Chelsea to use. Giving players that are the quality of Hazard, Willian and Costa in these situations is going to lead to problems for any team, and they didn’t disappoint. Hull found themselves 2-0 down in under 10 minutes. Chelsea used the spaces between the lines of the Hull midfield and defenders after building short form Courtois, overload on the left, and disconnect the Hull centre backs. In their usual 4231 formation, Matic and Ramires were the pivots, Cesc as the 10. In their short build up from the back, the central midfielders dropped to receive the ball from the centre backs – creating numerical superiority. 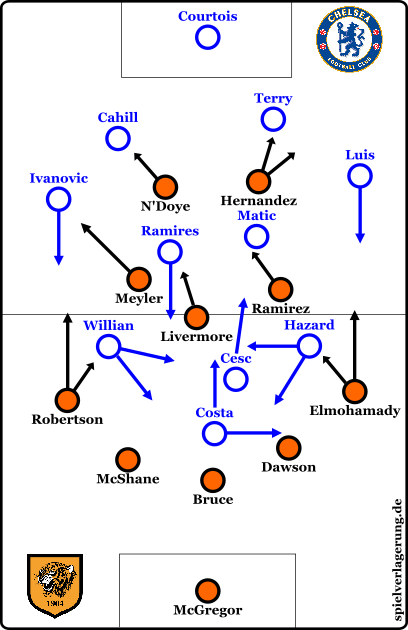 These overloads (7v5 outfielders) were not only formed due to the movements of the Chelsea players, however, as Elmohamady and Robertson were deep, behind the midfield line – man to man with Hazard and Willian. Upon creating stability in their build up, they would then look to progress into creation areas – passes to Costa, Willian and Hazard. Costa would make two movements in order to draw defenders out of position to open spaces to receive the ball: he would either drop deep followed by a Hull central defender man marking him – his layoff to Hazard before the first goal, for example – or he would move wide to the left. By moving to the left he achieved three things: drawing Dawson out wide to disconnect him from Bruce; leave central zones free for Hazard and Willian to receive the ball coming inside from the wing; and to play 1v1 against Dawson in counterattacks. His second goal come from the latter situation, for example. The switch to a 4231 in the 15th minute allowed Hull to have access to the ball in their pressing, which would allow them to disturb the Chelsea buildup and take control of the rhythm of the game. McShane was moved over to right back, Elmohamady moved up to the right, N’Doye switched to the left and Hernandez moved forward to the 10 position. Now it was 6v5 outfielders, where they could use cover shadows or the option to the free ball-far player was blocked. The reduction of stability in the Chelsea buildup would increase the use of Courtois in possession in some situations – not the best characteristics of his game – and increasing the amount of transitions in the game: pressing traps in central areas, by Hull, to win the ball, bad play under pressure and more long balls over the top from Courtois. As a consequence of the game becoming more transitional, Hull could use some of their more dominant players, such as Robertson supporting play on the left, more frequently. They, also, created some effective dynamics to attack the spaces behind the Chelsea defence, especially on the left. 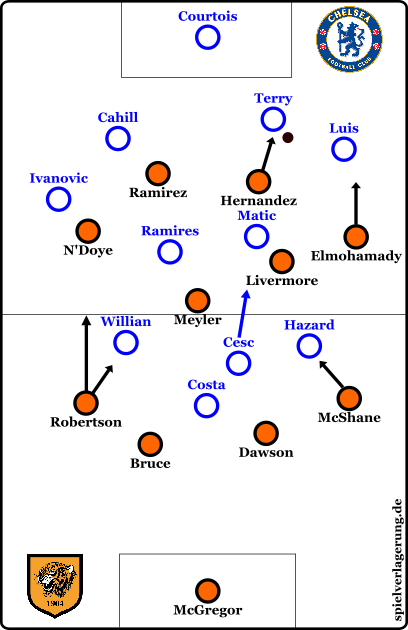 The new role of N’Doye on the left caused Chelsea problems, as he would receive the ball deep in the left half-space with various options: Robertson would overlap on the left flank, Meyler would move to the left to combine, Hernandez would make diagonal runs outside of Cahill to the space behind Ivanovic and Ramirez would be in the 10 position to receive or to be used as a 3rd man. In turn, both of the Hull goals came in this moment and potentially due to the changes – along with individual errors. In the second half Chelseas formation become asymmetric, with their attack now orientated in central areas – overloads, rotations, combinations. Hazard was now in a new role in the middle and Luis would be involved more in offensive actions, higher up on the left. Cesc and Ramires were used more as 8’s, Willian was also more free in his offensive movements, and Costa would remain central more often – not moving wide to the left as much as in the first half. In building they could play a much higher rhythm, as Ramires and Cesc would start deeper. They regained stability in their buildup, as well as being able to find earlier passes to Hazard and Willian – they would move closer to the ball in ball-near areas or deep in their new roles – to overload the middle of the field. Hull had difficulties pressing this, as it was a similar situation to the first half where they would have a lot of defenders deep,not involved, and were overloaded in midfield. As a consequence they become passive and dropped off as a team, mostly defending only in their own 3rd of the field. Chelsea now would play with longer phases of possession, as well as getting all their dominant and creative players involved in the game which would allow them to, eventually, to winning goal. A game where the changes made the difference for both teams. Chelsea were well prepared to take on Hull in their 352/532, but the change in formation and pressing surprised them. Mourinho, after the game, also talked about this and the positional changes in the second half which lead to them winning the game. All in all a game of a few slight changes from both teams which made the difference in favour of Chelsea. Thank you for analysing this match. I feel that Chelsea at times gifts the centre of the pitch to the opponent when playing away from home. That is disadvantageous for many reasons both in offensive organization and defensive transition. And could go a long way towards explaining them (frequently) dropping points on the road. They often try to create chances from the wing (occasionally the halfspaces) by overloading and combinations but very rarely I see it happen more centrally, where the danger for the opponent is bigger and there is a chance of counterpressing once possession is lost. I wonder if that is a tactical choice or just one of those things that happens for no good reason.